SPARCO-SP02600GR. An ultra-cool and ultra-soft tri-blend material T-shirt from Sparco. Great for winter get-away vacations, layering in the cooler climates, or just chilling out. SPARCO-SP03100NR. 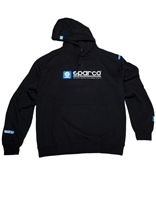 Genuine Sparco black hoodie. Warm & cozy. One of our favorites for cold days in the shop!